The palm-lined outdoor pool invites you to make a day of it. Pack beach toys, snacks and plenty of sunscreen. Escape to your private balcony as often as you like. Compare pink shoulders and surfing or snorkeling stories over dinner. 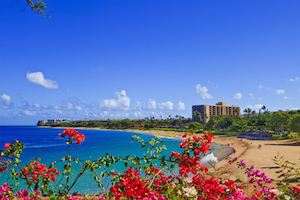 Located on the gorgeous white-sand of Kaanapali Beach. Your kids will have a blast on the waterslide and in the children's pool. It's a 6 minute drive to Kaanapali Golf Course Resort South. Grab your clubs and go. With a rockstar location along the warm, reef-protected waters of Maui’s western shore, Kaanapali Beach Club is all beach, all the time. The pool area is hopping too, with an acre-wide outdoor pool, hot tub and children’s pool, plus games and contests brilliantly organized by the activities committee. Head for the mini golf course and show off your impressive short game, while offering pointers to the little ones (even though technically they’re your competition). Then celebrate a game well played with treats from the snack bar. Divide and conquer, with one adult supervising the game room crew while the other hits the fitness center. Then regroup back at your condo for dinner and a few rounds of Heads Up! before claiming your spot on the sofa for movie night. Spacious one-bedroom vacation residences come with a variety of views, but have quite a few features in common. They’re all well over 800 square feet, easily sleep four, and come equipped with oversized jetted tubs and blissfully comfortable Tempur-Pedic mattresses. Put together a menu plan and stock up on groceries for the week – you’ll have a kitchenette for working your meal-making magic. Make a date with your book out on the lanai, with morning coffee or an afternoon glass of wine (or both). Be sure to round up your crew for sunset viewing, when the colors are at their most spectacular. And for low-key evenings in, either borrow DVDs from the front desk, or see if you can rally the troops for a game (or three) of Uno. Voted Best Island by Condé Nast Traveler for over 20 years, Maui’s the slam dunk of vacation destinations. With endless options catering to every interest, it’s literally impossible to go wrong here. Got a crew of foodies? Visit Wailuku for pastries from a mom and pop bakery, or head to the whaling town of Lahaina to sample Maui’s best farm-to-table fare. Sporty types? Surfing and paddle sports await. Sunset fans? Watch the sky put on its nightly show from Haleakala. Once the retreat for Hawaiian royalty and the capital of the Hawaiian kingdom, West Maui is now known for its spectacular beaches, shopping and dining scene. Stroll the Kaanapali Beachwalk, stopping for drinks along the way, and spend a few days on the championship golf courses in quieter Kapalua. Please note that housekeeping is provided only for stays of 7 or more nights. For more details, please contact the office using the information on the reservation confirmation received after booking.